Well, I hate to say it, but I think kayaking has been getting in the way of my blogging lately. Kayaking is just so fun it’s hard to do anything else…such as go to school, or blog about kayaking. A little over a week ago, it rained 5″ in VT and NH…again. Ben and I left Hanover after class on Friday afternoon hoping for the usual super high water options — Upper Jacob’s Brook, or maybe even Atwell Brook if stuff was really high. 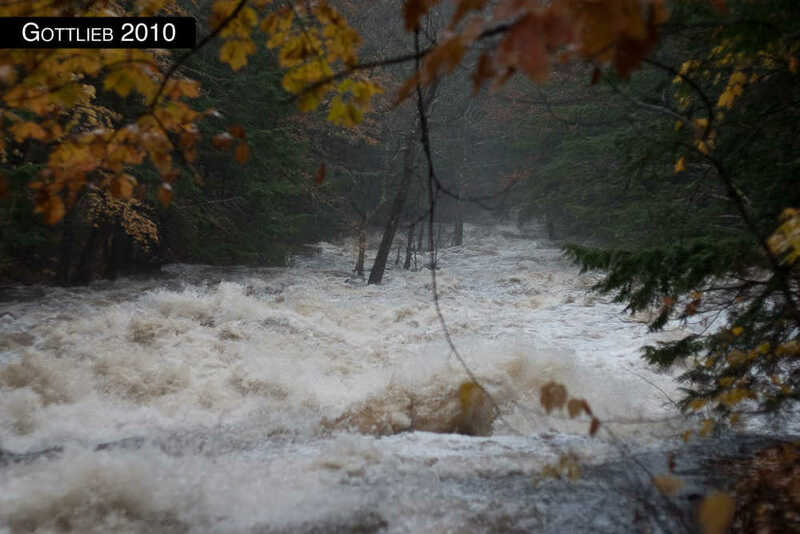 Lo and behold…Upper Jake’s was flooding the bridges on the way upstream. No dice. This creek is normally about 100cfs. At runnable levels. Unfortunately for him, I’d convinced James Deusenberry to abandon his plans to run Pike Brook solo (two hours away in eastern NY) and drive over to meet us. So we pulled out our gazetteers and decided to go explore something we’d both started hiking up once in the last few years and then got fed up with. And rather than hike up it — which, in retrospect, would’ve allowed us to abort mission much earlier — we decided to put on at the very top and set shuttle to the bottom. And there were no roads on the map in between. James contemplates the putin — the left side of the road in the picture. We drove up to Indian Pond Lake in Orford, NH, and seal launched off a culvert into a beaver-dam infested bog. Which turned out to be the most pleasant half mile of paddling of the day. Quite beautiful, really. Anyway, we ran a few beaver dams, floated through some tunnels of foliage, and eventually came out in a small rapid filled with wood. We portaged and found a bridge just downstream — a private road that was not on the map. We decided to scout a little further downstream just to see if it might be worth it and found an awesome sequence that dropped probably 30 or 40 feet. Naturally, we ran it, and thought maybe the creek would keep going like that. Nope. Four hours, a hole in my drysuit, and one sunset later, we were back at the cars, having paddled/portaged most of the creek until it became clear that a microburst tornado had come through and filled the creekbed with wood. At which point we decided to hike out on the logging road next to it…which unfortunately was also filled with wood. We ran one other decently fun drop, a 15′ slide that we seal launched into below a log jam. All in all, epic adventure. Don’t go run Indian Pond Brook. Sure, it drops 500′ in a mile, but it just isn’t worth it.